This is Tim, one of the many people who helped us deal with our flood. I later found out that Tim was exhausted from having worked long hours in recent days - but he didn't mention that during the hours that he spent working to prevent more water getting into our garage. We are very grateful to the very generous people who came to our aid. Aaron, Tim and others who worked to drain the water from the yard. Tim who stayed to make sure we were out of further danger. 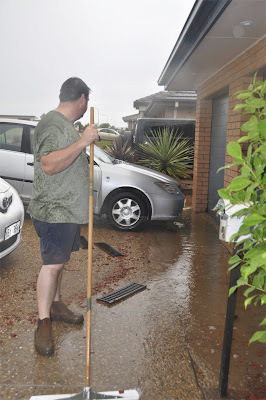 My brother who also helped to stem the flow of water, stayed to help us move boxes out of the garage and then returned the following morning to help with the cleanup. Gemma who gave us photos she'd taken in case we needed them for insurance purposes. Debbie who mopped up water in our entrance foyer and the following day washed the dirty towels. Kate who spent hours spreading out photos so they wouldn't stick together and get damaged. Keith, Natalie, Margaret and Ron who gave up a relaxing Sunday to help us with the clean up. It is inspiring to be on the receiving end of such generosity and it is reassuring to know that there are people we can rely on when the going gets tough. What lovely neighbours you have. I like water features but . . .